Reception check-in & cafe counter provides coffee, tea & hot chocolate for patient to relax with before treatment. 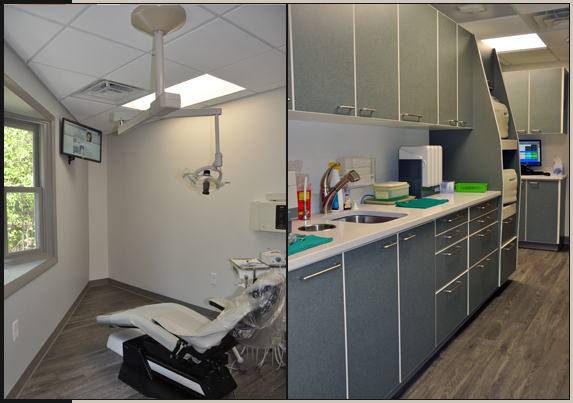 This operatory was created to sooth patients with warm finishes. 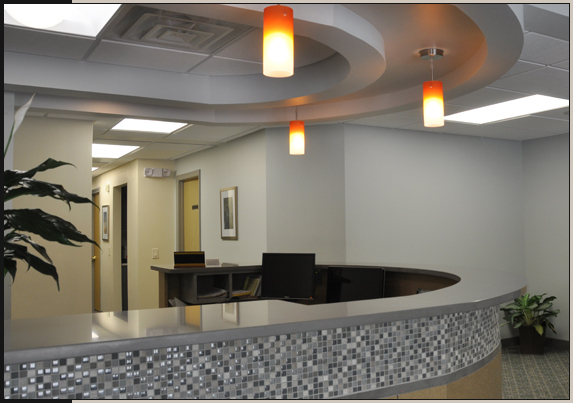 Ceiling soffit mirrors the arc shaped patient check in desk; FX Dental Design combined blue quartz counters, glass tiles, & light & dark wood finishes to create visual impact. The waiting area feels more like a den, with it's warm lighting and dark wood trim. Dr. Toback's patients comment that they truly enjoy the relaxing wait now. 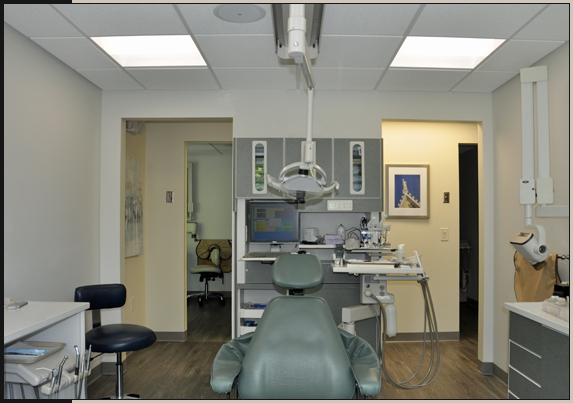 Operatory maintenance proof wood like floors are easy to clean & create a relaxing environment for dental hygiene patients. 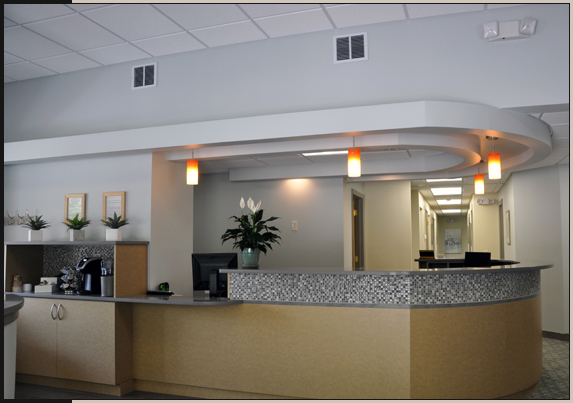 FX Dental designed this coat area to be tucked near the check-in counter but not visible from the entry, the planning details are always considered for both the dentist and their patients. X-ray - Consultation room was developed to provide patients with a direct view of large screen TV monitor, to clearly show patients why the doctor is recommending their course of treatment. Private conference room doubles as staff & student teaching lab. 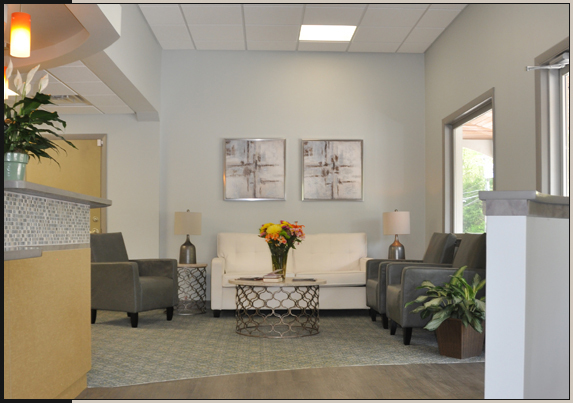 Dr. Toback requested the reuse of his existing waiting room seating in the new interiors. By using a carpet of blue & gold and adding a dark wood chair rail, Laura was able to blend old & new. Laura states, "it is all in the details". Golden blue carpet pattern flows effortlessly into restroom tiles. By adding sea glass accents, Laura created a harmony & texture.